Supergirl lets the supporting cast carry the episode with Kara having to take more care to protect herself from the Krytonite infused atmosphere. In real world terms, having Kara wearing a full body costume with a face obscuring helmet is a way for the production team to work around Melissa Benoist’s lack of availability due to either finishing her stint on Broadyway or taking time out to film her role in the upcoming crossover. This method allows Kara to still play a major part in the episode with limited input from Melissa Benoist. It certainly has its drawbacks such as many scenes feeling emotionally awkward because there is only a blank face to carry half a conversation but the advantage is that the rest of the talented cast get to showcase what they’re capable of. The first round of applause should go to Alex and Chyler Leigh who arguably takes the lead in this episode. Being director of the DEO has been a great fit for her so far this season especially with the added challenges it has brought to both her character and the show itself. Alex has undoubtedly taken the job at pretty much the worst possible time as her actions are under more scrutiny than ever before and the surge in violent anti-alien sentiment has created all sorts of tension surrounding the DEO’s operations. I was most impressed by the fact that Alex is willing to admit that she’s overwhelmed by what she has to deal with. She knew it would be a difficult job but the current climate isn’t anything she was prepared to deal with. Despite this she shows that she’s a very capable leader and projects the image of confidence to her subordinates so that they take strength from her even if it’s the opposite of how she feels. Alex does overcompensate for this by taking her frustration out on Kara who admittedly deserves it since she is ignoring well reasoned advice to stay where she is and not put herself in further danger. It is established that her suit is very delicate because it’s using exactly enough power to keep her alive and no more so taking herself into a combat situation will most likely end up being fatal. Naturally Kara refuses to listen and ends up almost getting herself killed because she has no regard for her own safety. When confronted about it her only defence is that she’s a hero and taking risks is just part of what she does. This is all valid from a characterisation point of view but also very pig headed because she doesn’t consider the wider implications of what she is doing. Putting herself in danger causes Alex to be concerned about her which in turn leads to mistakes being made that she can’t really afford. In Kara’s mind she is being noble and self sacrificing but it’s hard to see her as being any more than a nuisance. It feels out of place because this is something that season 1 Kara would do rather than the seasoned superhero she has become who understands that there is a bigger picture and sometimes she just has her part to play in it. 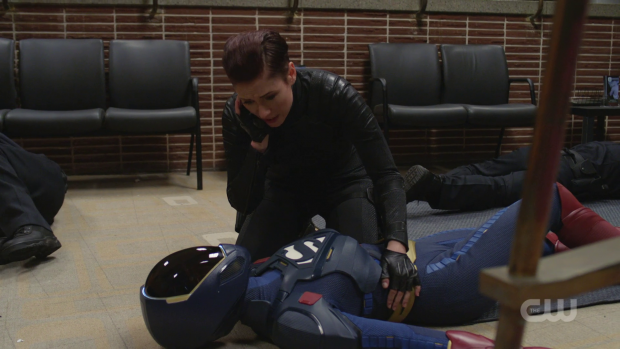 Despite the manufactured nature of this conflict it does work well because it shows how distracted Alex is by the situation and how worried she is about Kara while offering an opportunity for Chyler Leigh to deliver an excellent performance despite sharing the bulk of her screen time with an extra in a face obscuring helmet. Her performance helps make it less abundant that she isn’t actually sharing the screen with Melissa Benoist. Getting around this by cutting to inside the helmet periodically both works and doesn’t though it does come across as an Iron Man rip-off considering the camera technique and heads up display. There are other pressures for Alex in this episode such as the President ordering her to leave Supergirl off the board for the time being. It’s an order rather than a request and she feels compelled to follow it despite not really believing that it’s the best course of action. Ultimately she decides that putting Kara back in the field is worth the risk at that time which doesn’t entirely add up but sort of works as something to encourage her to find her own way of solving a problem rather than following the direction of others. Encouraging Kara to be reckless doesn’t seem to be the right move but it is a sign that she is finding her own way to run the DEO rather than looking to what had come before. The consequences of that decision is that the president loses faith in her and sends someone to supervise. The situation provides ample justification to make use of the excellent J’Onn/Alex connection. There are somewhat on the same page in this episode because they are both questioning their life choices to the point of doubting themselves. Alex doesn’t think she has what it takes to lead the DEO and J’Onn is unsure of his decision to pursue a path of non violence. His reason for trying it was noble enough as it was his father’s way and he is adopting that mantra as a way to honour him. He is slowly realising that his father’s ways won’t necessarily work for him and finds himself on the way to figuring out what should define him. It will be a long road but having him fighting once again is a sign that he might go down the route of figuring out what necessary violence is rather than vowing never to get in a fight again. 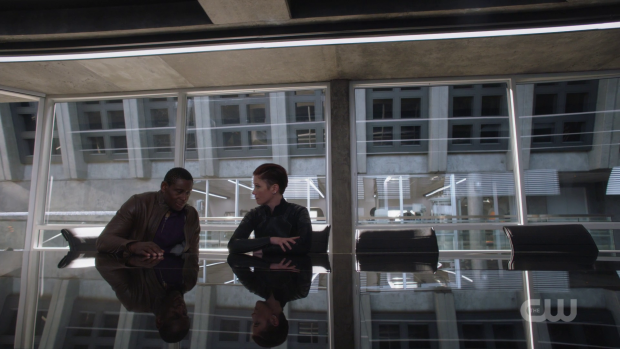 It makes sense that it would take a powerful catalyst such as Kara almost dying to make him reconsider decisions he has made which ties nicely into the overall dynamic between J’Onn and the Danvers sisters while servicing the main season plot. The hesitation both Alex and J’Onn exhibit before they finally open up about their problems helps sell the moment between them as it makes it feel more real. J’Onn’s role in the episode has him cross paths with Fiona’s fiancé; Manchester Black (David Ajala). He also practices non violence just as J’Onn does at this point but his way of doing so is very different which makes for some nicely creative action sequences where he dodges attacks and uses the momentum of his opponents against them. This means he can still defend himself while not engaging in any violent acts. Manchester Black is a great addition to the collection of characters because he feels far less predictable than the others. His entire motivation for this episode is finding Fiona which always comes across as sincere even though they share very little screen time together. It’s apparent in David Ajala’s performance how much he cares for her and his determination to get to the bottom of her disappearance is infectious. It also helps that David Ajala is intensely charismatic with his attitude making for a good foil for J’Onn. The death of Fiona was really problematic as it didn’t feel entirely necessary given the circumstances. There was more for Fiona to do in this show beyond appear for two episodes and die to motivate Manchester Black away from his vow of non violence. Her death acts as something of a tragic origin story for the character who looks to be pursuing a more lethal outlook in life but it’s unnecessary as Manchester Black would have worked just as well as an unpredictable element rather than being motivated by vengeance. This episode manages to find a really interesting use for James as Guardian which is something I never thought I’d say. The framing of this is a little problematic as James seems to spend the episode bursting to jump into action now that Supergirl is off the board. This means he needs very little encouragement from Nia who urges him to forget about the repercussions and do the right thing to protect the city by standing up for those who need help. Once he goes into action as Guardian he finds himself in the crosshairs of the law while also being held up as an symbol of anti-alien sentiment since he is seen fighting mind controlled aliens. This calls back to what I’ve been saying about the villain of this season not being something that Kara can punch until its defeated. Guardian being used to further the cause of Ben and his “Earth First” movement is a great example of how easily public opinion can be manipulated by the media and may serve as an example of what James could have been doing with the resources of the media outlet he has at his disposal. Speaking of enemies that can be punched, Ben is proving to be a credible and intelligent threat through his manipulation of the innate abilities that aliens have. In this case the weapon he uses is Star Trek II: The Wrath of Khan style mind control to prove that aliens can be dangerous. It should be obvious by this point that aliens have the potential to be dangerous but this is a time where the general public are likely to be swayed by powerful examples and Ben knows exactly what to do to make the most impact. This makes him very dangerous because he has the entire world to hide behind. The resolution of the atmosphere irradiated by Kryptonite problem is really underwhelming considering how massive a problem it seemed just one episode ago. This show still has an issue with crafting simplistic solutions to large scale problems which cheapens the stakes considerably. Last season was bad for this and it’s clear that the writers are still ironing this issue out. One saving grace is that engaging character beats can come out of this. Lena and Brainy worked together briefly last season and it’s great to see this happen again while adding more layers to Brainy as a character. The situation with Kara and the prejudice he recently experienced has caused him to lose control of his emotions. This results in him crying which he amusingly refers to as “tears of logic”. The perfect counterbalance to Brainy’s emotional outburst is Lena’s more measured demeanour. She advises him to do what she does and compartmentalise her feelings into little imaginary boxes that can be pushed so far below the surface that they no no longer offer any kind of distraction. This is obviously not healthy but it’s how Lena deals with her particular emotional issues and it does have merit as a technique in certain situations. I like the Lena/Brainy pairing and would like to see it develop to the point where Brainy learns how to strike a balance between expressing his emotions and controlling them that could help Lena realise that there is a healthier way to deal with things. Another well put together episode that doesn’t let potential limitations get in the way of compelling character driven storytelling. The real world reasons for Melissa Benoist’s reduced availability created a potential problem for the show that has the character in a full body suit with a face concealing helmet for almost the entire episode. Periodic cuts to inside the helmet aren’t really enough compensation and feel a bit like an Iron Man rip-off but the writers use this to let the rest of the cast take the lead. 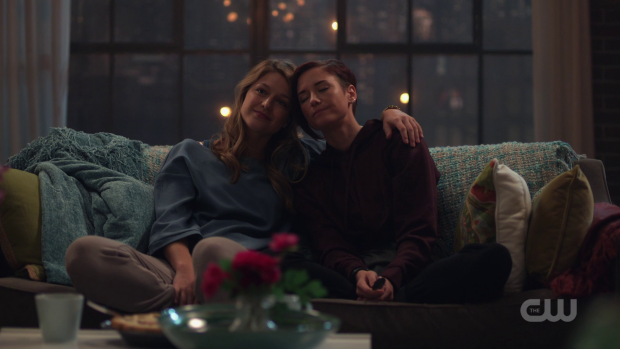 Alex is particularly well used in this episode plagued by self doubt over her leadership ability which she takes out on Kara who admittedly deserves it for acting reckless and self righteous. Her arc is around finding her own way to do things which has consequences to it. The situation provides a great opportunity for her and J’Onn to discuss how they feel about their current life choices. J’Onn is starting to realise that non violence might not be for him so starts down a long road to finding what defines him. The addition of Manchester Black as a foil for J’Onn as well as an unpredictable element is great though having him become motivated by avenging his dead fiancé is both cheap and uninteresting particularly when there were better things for Fiona to be doing. The return of Guardian could have been a huge problem for the show but the writers turn this into an asset. Guardian becoming an unwilling symbol of anti-alien sentiment because he is seen fighting mind controlled aliens is brilliantly unexpected and shows how big a threat Ben is since he knows exactly what buttons to push to sway public opinion in a certain direction. 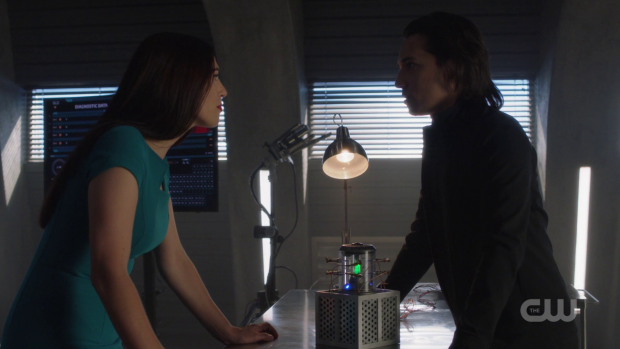 The resolution of the Kryptonite irradiated atmosphere plot is far too simplistic considering the scope of the issue though it’s great to see Lena and Brainy work together again with Brainy receiving more layers after losing control of his emotions and not knowing what to do about it. Lena’s advice to comparmentalise those emotions and push them deep inside certainly isn’t healthy though it is credible in certain circumstances. Hopefully this begins an arc for Brainy to learn how to strike a balance which in turn could help Lena.